A few years back, some atheists wanted to change their name because of the negative connotations associated with the word atheist. One suggested term was "brights", which is fallacious because it implies that they are smarter than everyone else because they choose to reject God. That kind of whitewash will not fool people, since the negative connotations have been earned, what with the protests, persecution of Christians, trolling, and generally negative attitudes in general. Some tips given for mental health and to reduce depression is to stay away from negative people. I suggest that folks start with avoiding internet atheists. Similarly, theistic evolutionists have a deserved bad image because they prefer the magisterial view of secular science philosophies to the written Word of God. It's like they have their evolutionism wagon and slap a sign on the back saying "God used evolution", and that somehow validates their views. TEs often saddle up with the atheists and ride for the Darwin brand on the owlhoot trail, dry-gulching biblical creationists who have a high view of Scripture — especially regarding Genesis. (Watch TEs ridicule biblical creationists, and atheists get out of their clown car to applaud the abuse.) 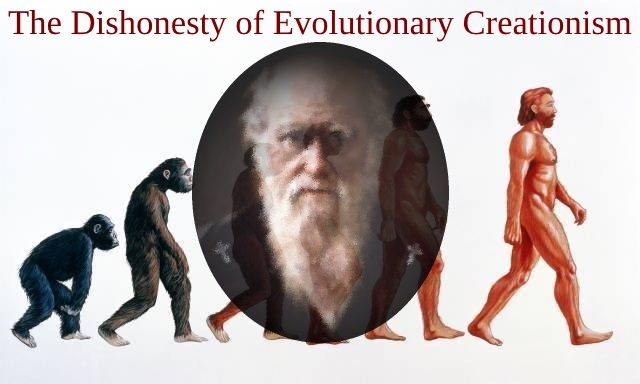 Some theistic evolutionists are using the moniker "evolutionary creationists". Well, that's confusing! Like I've said many times, definitions matter (see "Science, Evolution and the New Golden Rules" for an article on this). Some atheists believe in God, and I heard one professing atheist call in to a Christian radio show saying he was a Christian because he liked some of the things Jesus said! If you study on it a spell, it makes sense that if someone claims to be a "creationist", he or she rejects evolution and affirms the Bible. Biblical creation science is odium theologicum to theistic evolutionists and old earthers. So, people who uphold Darwinism and mix that false religion with Christianity need to read the book of Galatians. But since they are being deceptive, I doubt that they will take the Bible seriously. Really, what is someone supposed to think with a name like "evolutionary creationist"? Anyone involved in a debate knows that definitions are important. In a debate, controlling the definitions of terms allows control of the debate’s framework and frequently determines the winner. This lesson was on my mind when I heard about a conversation a colleague had with an evolutionist who served as a college professor in a nearby town. He is a theistic evolutionist. He believes in God and confesses faith in Christ, but believes the evidence for evolution is compelling and has been critical of Intelligent Design (at AiG, we are clear that God is the Intelligent Designer). That was why he surprised my colleague when he insisted that he too was a creationist. He even wanted my creationist colleague to agree with him that they both believed God was the creator, and therefore were both creationists. My colleague wouldn’t do it, noticing immediately that the professor was trying to reinterpret the words creation and creationist for his purpose. To read the rest, click on "Can an Evolutionist Be a Creationist?" Dear Piltdown, God bless you ;) Enjoying your blog.